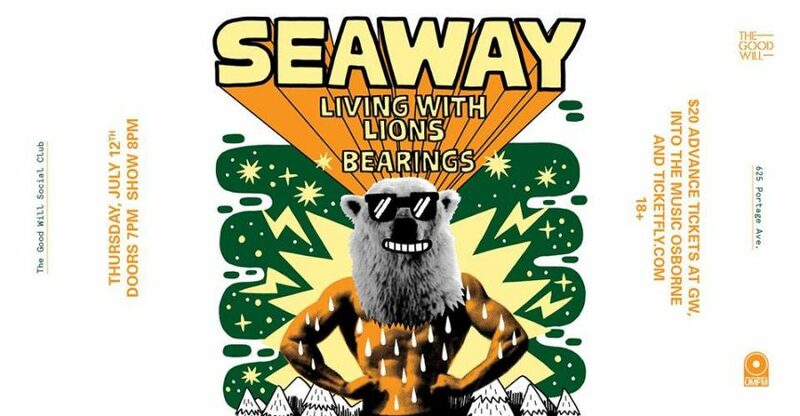 Sea­way are one of Canada’s top pop-punk acts and rep­re­sent a throw­back to the hey­days of the genre when the focus was on fun. On Thurs­day July 12th the Toron­to quin­tet bring the joy to the Good Will Social Club at a spe­cial show fea­tur­ing Vancouver’s Liv­ing With Lions and Ottawa act Bearings. Advance tick­ets are only $20 plus fees and area avail­able now at Into the Music Osborne, the Good Will and online at Tick​et​fly​.com so get yours and come see an act that has brought the fun to audi­ences across North Amer­i­ca and the Unit­ed King­dom when Sea­way play the Good Will Social Club, Thurs­day July 12th, proud­ly pre­sent­ed by 101.5 UMFM.